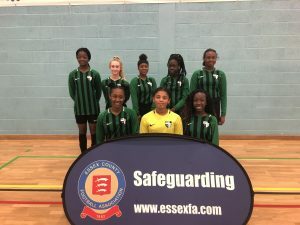 On Monday 4th February the Under 13 Girls Barking and Dagenham futsal qualifiers took place at The University of East London Sports Dock. We were in a group of 7 teams (Forest Gate, Frances Bardsley, Kingsford, Eastbury, St. Angela’s and The Cumberland School) and The Sydney Russell girls come out on top winning the whole competition! They won 5 games and drew 1 and did not concede a goal for the whole competition. They were absolutely outstanding and worked so hard for the whole day. Essex FA commented on how respectful the girls were and how hard they worked on the pitch throughout and that they were worthy winners. We couldn’t be any prouder of the girls! They now progress to the next round of county finals.